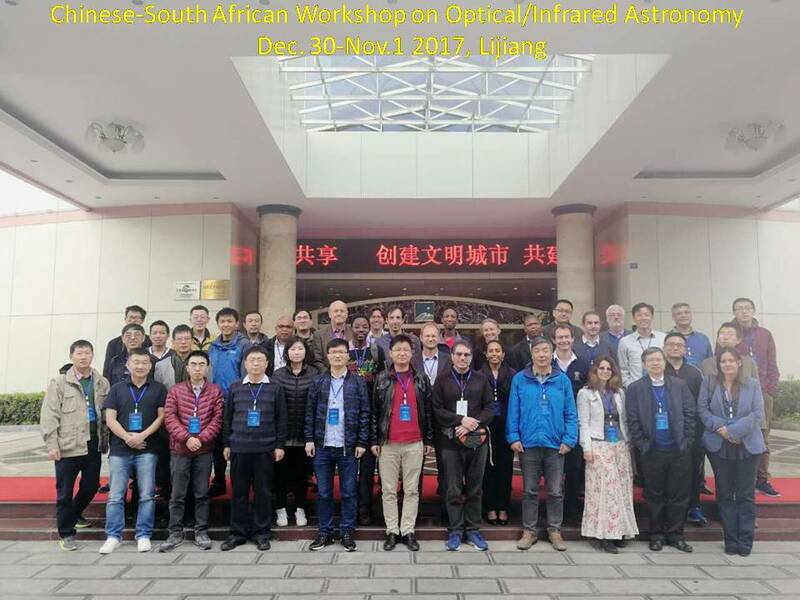 The China-South Africa Bilateral workshop on Optical/Infrared Astronomy was held in Lijiang from Oct. 30 to Nov. 1, 2017. Prof. Jinxin Hao, the Deputy Director of National Astronomical Observatories, Chinese Academy of Sciences (NAOC), Prof. Jiancheng Wang, the Deputy Director of Yunnan Astronomical Observatory of NAOC (YNAO) and Prof. Petri Vaisanen, the Head of Astronomical Operations of Southern African Large Telescope (SALT) of South African Astronomical Observatory (SAAO) attended the workshop. About 50 astronomers from SAAO, NAOC, PMO, SHAO, YNAO, KIAA and other institutes and universities joined this workshop. This workshop, as one of five series of bilateral workshops , is selected and supported by NAOC and National Research Foundation (NRF) of South Africa jointly under the framework of bilateral collaboration. During this workshop, South African astronomers introduced the operations and observations of telescopes, especially SALT, and the improvements in instruments and progress in research in SAAO. Chinese astronomers introduced the optical/infrared facilities in China, especially LAMOST and other telescopes, such as 2.16m and 2.4m, as well as the instruments and research projects. Some on-going telescopes and instruments have been also presented. Both Chinese and South African astronomers have deeply understood through this workshop. They also desire for the further tight relationship for cooperation. This workshop is very important to further improve the cooperation between Chinese and South African astronomical society in optical/infrared field. The both sides agreed to develop further collaborations based on the observational facilities in two countries, such as LAMOST and SALT and so on. We expect more collaboration in Astronomy between our two countries in the near future.